Unlike Basic or Continuity Items, Seasonal Items have Start & End Dates, essentially a limited life cycle that requires careful planning and management. Churchill has several predictive analytics and specialized demand forecasting solutions that can enhance your short life cycle item planning. Here are two popular Churchill solutions. The quicker your planners can understand seasonal progress, the sooner they can execute corrective tactics that will optimize the financial objectives of your seasons. Churchill's Short Life Cycle Demand Forecaster provides very detailed preseason demand forecasts and then updates and provides inseason sell-thru forecasts all in the detail that presents opportunities for corrective action. 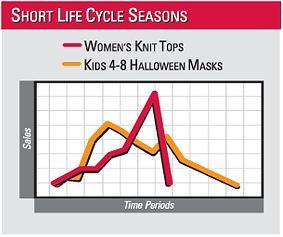 In the real world of retailing, life cycle seasonal demand (seasonal profile) varies by product, geography and even changes in vendors. Today your planners probably build seasonal merchandise, assortment and allocations plans based on average historical sales history. But in today's hypercompetitive retailing world, highly detailed seasonal demand (not sales) profiles is required. As a service or study, Churchill's clustering and profiling solution, Profile Cluster Builder can deliver the detailed seasonal profiles that you require.